1. 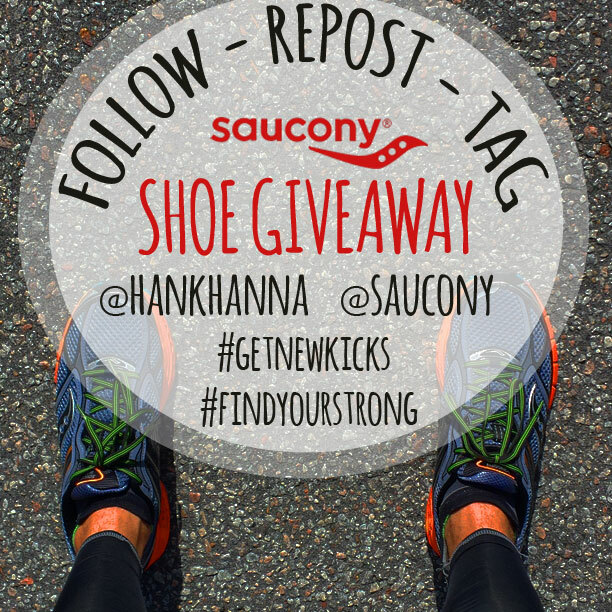 Go to Instagram and follow Hank Hanna AND Saucony. If you do not use the tags above your entry will not be accepted. Also your account must NOT be private. If it is private no one can see that you reposted it. 4. You can post up to three times a day and each post will count as an entry into the give away. 5. The winner will be randomly selected from all entrants on December 18th and announced before by 9:00 PM EST. 6. I will announce the winner on Instagram and that person will need to provide me with their email address so that I can send them the necessary information. The winner will be provided a redemption code for a free pair of shoes to use at Saucony.com at checkout. Winner will be responsible to pay shipping costs, but hey! That’s like $8 for a brand new pair of Saucony shoes! So how you like them apples folks? Don’t say I never did anything nice for you. Or if you do, at least tell my grandma I was nice. She is always so worried that I might lose my Southern chivalrous demeanor for some reason. Sounds like I’m going to enter to win a new pair of Sauconys! I think my current ones will need retired here soon. Hey Axel. Any pair. You will get a code to use at Saucony.com.